On Monday 24th February we are having a travel night so members are invited to bring along their photos (on memory stick) to share your recent adventures. We will hold our meeting in the Boardroom of the Soccer Club. Last Monday night it was a pleasure to welcome again our first successful National Youth Science Forum (NYSF) nominee, Erin Westley, who was accompanied by her father, Peter. In thanking the club for its support, Erin spoke in support of her formal and extensive written report, brief extracts of which are below. “I would like to thank all the members of your club for providing me with this amazing opportunity. It has been fantastic to see first-hand Rotary’s incredible efforts that enable the National Youth Science Forum to run. “The science program for me was special because I had opportunities not normally open to me. I was also able to gain insight in the role of science in other areas such as law and policy. The people in NYSF are all incredibly supportive – the staffies and the other students – and there were many instances where we were encouraged to meet new people while having a lot of fun. We also had sessions on communication, body language and public speaking and throughout the course of NYSF I have grown as a person and grown in confidence. At our meeting, Erin spoke with confidence and candour about her experience and made several suggestions for the club, and district, to consider when planning NYSF. The continuing success of our BBQ’s is due to our members, families and friends happily volunteering for these events that provide an excellent opportunity for our Club to be seen in our local community of Gungahlin. Over the coming months we will be kept busy with several BBQ’s at Magnet Mart in Gungahlin and plans are underway for opening of the new Gungahlin Sports Centre on 29 March. District 9710 Birthday Bash, Canberra, planned for Sunday 23 February has been cancelled. On Monday 17th February we will hold our meeting in the restaurant section of the Soccer Club. Erin Westley, our recent participant in the NYSF will be reporting on her experience. I believe that I was the first applicant to be sponsored by the Rotary Club of Gungahlin to participate in this program. I would like to thank all the members of the club for providing me with the financial support I needed in order to have this amazing opportunity. – Erin Westley Please note: the Soccer Club has new catering arrangements, with a new menu. Last Monday night, we had a productive Club Assembly and concurrent Board meeting. A lot of business was done and we still finished on time. Sandra Mahlberg (PP & PHF) has been given further well-deserved recognition and is shown receiving her Australia Day Medallion and Certificate of Achievement award by the CEO of Calvary Health Care ACT, Ray Dennis. This recognises her many professional contributions to nursing including her leadership, personal involvement and commitment to Rotary’s ROMAC program. District 9710 Birthday Bash, planned for Sunday 23 February has been cancelled. On Monday 10th February we will hold our Club Assembly/Board meeting in the Soccer Club’s Boardroom. Please note: the Soccer Club has new catering arrangements, with a new menu. The Club’s CEO has advised that the menu is excellent and most dishes are very reasonably priced. At this stage, there is no fixed-price menu for our members so it is recommended that we choose from the menu in the dining room until new arrangements can be made. Last Monday night, members, partners and guests enjoyed a social night at the Thai Herb restaurant in Gungahlin. We welcomed guests Sarah Jewell the 2012/13 ambassadorial scholar our District sent to Dublin, Member Sandra’s brother Ian from Tasmania, and AG Graeme Kinraid popped in later to say hello. 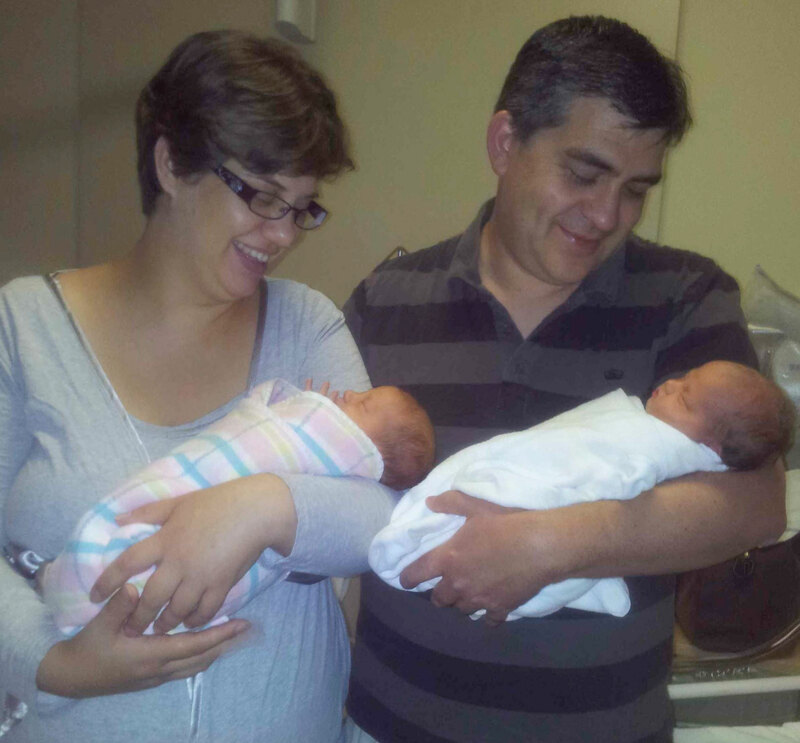 Members and Friends of the Club will be delighted to hear that Nerida and Shane welcomed twin girls last week, Hadley & Lariel. All well. Our District Governor, Maureen Manning, extends an invitation to members and guests to the much-anticipated birthday celebration (flyer attached). Other Important Rotary Dates for Next Year! Members are reminded to register early for these great opportunities.